Genetic transformation of wheat and barley; Genetic transformation of rice and maize; Product development in cereal biotechnology; Using biotechnology to add value to cereals; Molecular biological tools in cereal breeding; Risk assessment and legislative issues; Current practice in milling and baking; Current practice in malting, brewing and distilling. Genetic modification is one of the most important and controversial issues facing the food industry – nowhere more so than in cereal production and processing. Cereals provide the cornerstone of the world's diet, of which 50% comes from wheat, maize and rice. This major work explains the techniques involved and their enormous potential for food producers and consumers, from cereal breeding to milling, baking and brewing. It also explains how this new technology is regulated, the methods for assessing its potential risks, and the ways that cereal biotechnology can add value, from weed control and disease resistance to improved nutritional properties, processing functionality and product quality in food processing. Much has been written on this significant issue, but until now there has been no guide for both those on the academic side and those working in the industry itself. By examining both sides of the coin, this book bridges the gap between these groups, giving each a greater awareness of the other's role, a more rounded picture of the business and an increased understanding of all the issues at stake. 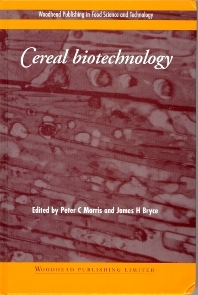 Cereal Biotechnology is an authoritative reference for food processors on a key new technology, an essential guide for biotechnologists on the range of commercial applications within cereals processing, and a vital contribution to the debate for all those concerned with genetic modification in food processing. Dr Peter C. Morris lecturers in the Department of Biological Sciences at Heriot-Watt University. Dr Morris lectures in Plant Molecular Biology and has comprehensive experience in many aspects of transgenic crop research, both fundamental and applied. Dr Morris is involved in the foundation and running of a SHEFC-funded transgenic cereal initiative at Heriot-Watt; together with a supporting consortium he is establishing a Scottish centre for cereal genetic manipulation. Dr James H. Bryce lecturers in the Department of Biological Sciences at Heriot-Watt University. A lecturer in Plant Biochemistry, Dr Bryce has worked extensively on the biochemistry of photosynthesis and respiration. Dr Bryce is involved in the foundation and running of a SHEFC-funded transgenic cereal initiative at Heriot-Watt; together with a supporting consortium he is establishing a Scottish centre for cereal genetic manipulation.